I am currently in dire need of a haircut but I'm having trouble deciding whether or not I should try something new. I have been cutting my hair exactly the same way since I was in high school...I'm not sure why, because I've never been in love with it. My husband has been telling me I need to try bangs for quite some time now but I never have the guts for it. 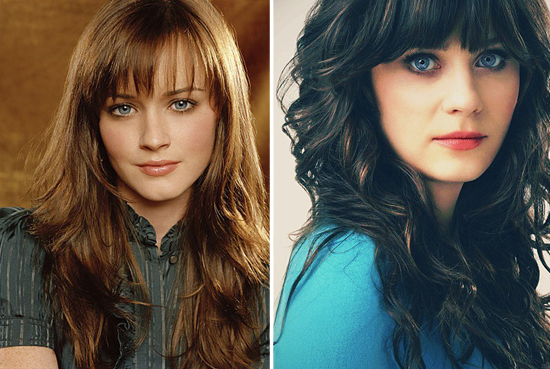 Plus, I think I have the wrong face shape/facial features for bangs, but I really don't know. I've been browsing Pintrest for some hair inspiration although it's been a lot harder then I thought it would be! It seems like I always see people and pictures of hair styles that I like, but every time I deliberately search for it I can't find anything. Where do you usually go for hair inspiration? I've been fighting the urge to cut my bangs! Love the photo of Zoey - I also love those (cheesy) Hair Mags...lots of styles to look through when the urge hits! ooh bangs would be so fun! You should try it, just to do something different. What I always tell myself is that thankfully hair grows back! :) I'm in desperate need of a hair cut too. My husband likes that I've been growing it out so maybe I'll just get a trim. You would look great in bangs. I was contemplating them lately too bc I am trying my hardest to grow out my hair but am seriously bored and want a change. BUT the last time I had bangs they ended up being pinned back a lot. If you don't mind the feeling of hair on your face then go for it! To me they felt uncomfortable (but it was also summer, so winter it might be better). Also, don't be scared, if for some reason you hate them (I dont think you will) there are so many ways to pin them back (twists, braids). Just go to someone who knows what they are doing to cut them! I recently tried bangs and I love them (although they took a little getting used to)! The good thing about hair is that it always grows back and bangs grow really quickly, so I say go for it! pretty hairstyles! My hair has been the same forever too - it's super curly but I straighten it almost everyday - maybe I should think of a new style too! What wonderful inspiration! I've basically had bangs since birth. Not having them makes me feel too self-aware about my forehead. I've always cut mine myself, but if you're nervous it might be better to go to a professional. I've always had good luck with student saloons (what can I say, I'm a cheapskate). Hard question! Hair cuts are a nightmare everytime!! But I like the first picture and I think it would be nice on you! Bangs are such a commitment, but I think you could pull it off. Complete opposite here...had bangs for the past 20 years-because I hate my forehaed...but am contemplating growing them out now. I hate that stage when they are too short to pull or pin back- but too long to wear down. Very annoying. aND THEY ARE very HIGH MAINTAINENCE. Merry Christmas!!! Zooey D!! I got bangs right after "New Girl" started. Obsessed. Do it!